We provide the very best dog home boarding near you in the Pershore and East Worcester area. Dogs deserve a holiday too! Hello my name is Sheila and I am proud to be your Barking Mad dog sitting representative in the East Worcester area. I am delighted to provide the very best professional one-to-one dog home boarding service local to you. I live in Drakes Broughton, Pershore, with my rescue dog Tilly; she is adorable. It has to be said that whoever coined the expression, “Diamonds are a girl’s best friend,” obviously never owned a dog, and certainly not one like Tilly! Although we had family pets when I was a child, the foundation for my enduring passion with animals was further enhanced whilst employed as a horse groom caring for shire horses and riding ponies. My involvement with Barking Mad was initially instigated by a friend and neighbour of mine – she was a Barking Mad host. At that time, my late husband, Alan, and I were both owners/licensees of a pub in Peterchurch, in the Golden Valley area of Hereford. After his passing I realised that my soul was crying out for a change in location and career. 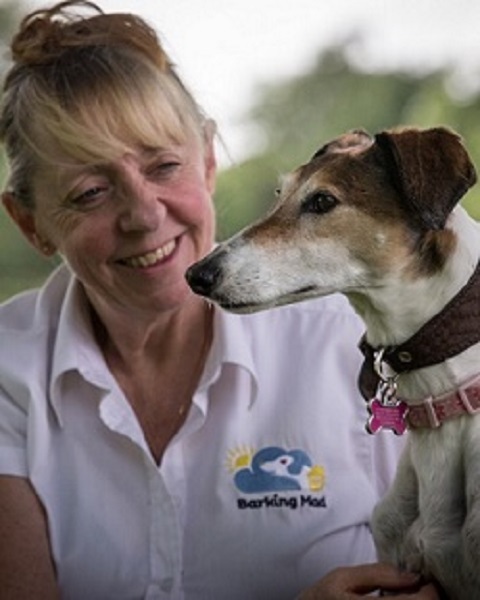 Being a sociable person with over three decades of first-hand experience dealing directly with members of the public I realised that I could combine that knowledge with my passion for working with animals and become a Barking Mad Franchisee. As a Barking Mad dog sitting business owner my own personal objective, and that of my hosts, is to provide dogs with an unparalleled level of care; owners and dogs deserve nothing less. Everyone thinks they have the best dog. And none of them are wrong! 01905700722 or email sheila.hughes@barkingmad.uk.com or message me on Twitter or Facebook. If you are interested in becoming one of our valued hosts please contact me using the details provided above.